NAUSICAA OF THE VALLEY OF THE WIND (1984) and MY NEIGHBOR TOTORO (1988); Dir: Hayao Miyazaki; The Studio Ghibli Collection at Landmark Midtown Art Cinema, Fri. Nov. 9 through Thurs. Nov. 15; NAUSICAA plays November 9 at 1:45, 7:00 p.m., and 12:15 a.m.; MY NEIGHBOR TOTORO plays November 11 at 12:15, 5:00, and 9:40 p.m.; showtimes for additional movies here; all films presented in 35mm. NAUSICAA trailer here and MY NEIGHBOR TOTORO trailer here. Landmark Midtown Art Cinema may not be the center of the known universe, but for film lovers and adventurous families from November 9-15, the theater may certainly feel like it. That’s because the Art Cinema is playing host to an incredibly special event that will see almost the entire Studio Ghibli collection light up the screens, each film proudly offered in an increasingly-elusive 35mm presentation. Some film nuts may just move into the building. While Ghibli doesn’t have the widespread name recognition in America that, say, Pixar enjoys, Ghibli and co-founder/frequent director Hayao Miyazaki combine to form one of the biggest animation brands in the world, especially in the studio’s home country of Japan where Ghibli’s films routinely break box office records and land major awards. Here in the states, Ghibli films have competed favorably for critical attention with the mighty animation brands of Pixar and Dreamworks, winning the second-ever Best Animated Feature Oscar for SPIRITED AWAY in 2002 and scoring another nomination just a few years later for HOWL’S MOVING CASTLE (2004). In the world of animation, Miyazaki and Studio Ghibli are already considered legends, and they’re currently working at the peak of their talents. So who is Hayao Miyazaki? An animator and artist, Miyazaki was already a 16-year veteran of the Japanese animation industry when he released his first full-length film, THE CASTLE OF CAGLIOSTRO (1979), based on the long-running LUPIN III manga and anime TV series. Miyazaki followed that success by moving into the world of manga—Japanese comics—where he created his own series about a girl caught between warring territories in a dying post-apocalyptic world. Miyazaki named his series NAUSICAA OF THE VALLEY OF THE WIND and he helmed a feature adaptation in 1984 that garnered enormous critical and commercial success in Japan and convinced Miyazaki and co-founders Isao Takahata and Toshio Suzuki to make the move to their own studio. So, while NAUSICAA is not officially a Studio Ghibli release, all things Ghibli began with that film and it holds a special spot of reverence in the collection. Likewise, NAUSICAA is one of the crown jewels in the Ghibli film series playing at the Art Cinema because, frankly, it’s so rarely screened. Although widely available on DVD today, the original American release was marred by a lack of respect for the material. NAUSICAA received international distribution before Ghibli had made a name outside of Japan, and local producers didn’t hesitate to make massive cuts and add bad dubs to make the film “palatable” for their audiences. As a result, truly terrible versions of the film still exist out there (including an American hack job called WARRIORS OF THE WIND). Fans can finally see the original cut on 35mm and exactly as Miyazaki intended when NAUSICAA hits the screen on November 9. 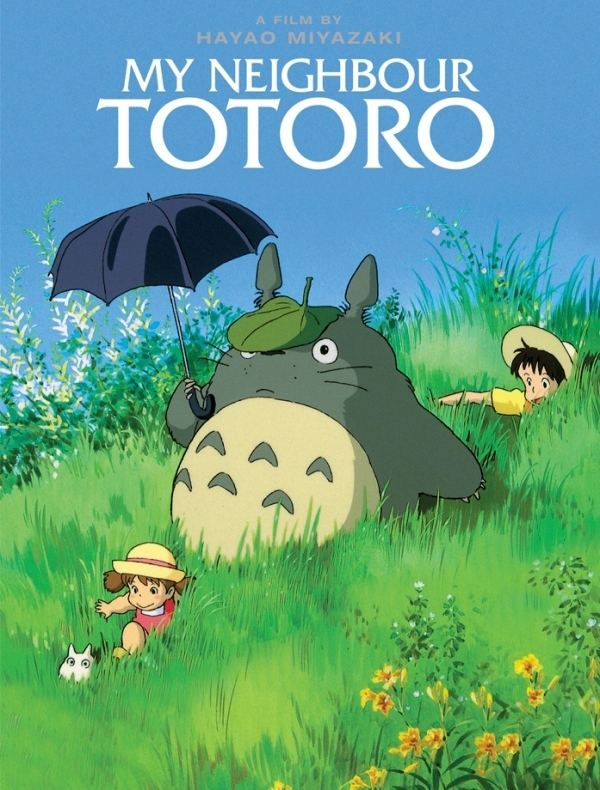 Thanks to that highly public Oscar win, SPIRITED AWAY is perhaps Miyazaki’s most well-known film in America, but MY NEIGHBOR TOTORO is arguably his most popular. The third official Studio Ghibli release (and the second directed by Miyazaki), TOTORO is the story of two young girls who move to the country to be closer to their gravely-ill mother. Left largely to their own devices, the girls soon discover that the forest around them is teeming with fantastical creatures who become close companions just as the girls need them the most. Absolutely packed with Miyazaki’s trademark imagination, whimsy, and heart, TOTORO has become something of a signature film for Studio Ghibli, who adopted the film’s primary critter as their studio logo, and for fans who obsess over the film’s compelling fantasy elements (who doesn’t want to ride in a CatBus?) or create their own wild theories as to what it all means. (Don’t click here unless you’re ready for massive spoilers, possible lunacy). Bottom line, it’s hard to go wrong with any Studio Ghibli release, but if you’re only going to make it to one, MY NEIGHBOR TOTORO is a must-see. The film series runs from November 9-15, and while movie fanatics and toon-heads will be arriving en masse, families looking for wholesome entertainment for their children have plenty to be excited about as well, especially parents of young girls. One of the trademarks of Miyazaki and all of Studio Ghibli is the presence of strong, complex, young female lead characters. In an American marketplace that mostly serves a particular princess archetype to girls, Ghibli is powerful counterprogramming. The sisters at the heart of TOTORO and the stoic leader of NAUSICAA are two great examples, but so are the brave heroes of SPIRITED AWAY, KIKI’S DELIVERY SERVICE (1989), and THE CAT RETURNS (2002). Children seeking action and adventure may take to the war and strong themes of PRINCESS MONONOKE (1997) and younger children will delight in the Ghibli’s PONYO (2008), a sweet-natured take on “The Little Mermaid” story. Just be aware that all films are presented in the original Japanese with English subtitles—many kids will enjoy reading along with the story, and those who can’t will have plenty of visual input to enjoy on the screen, and a lot of engaging questions to ask on the car ride home. Overall, the Art Cinema’s film series is offering just about every film in Studio Ghibli’s catalog, including the little-seen MY NEIGHBORS THE YAMADAS (1989), a comedy from Takahata that diverges from the usual Studio Ghibli art style into something a bit more experimental. In fact, the only films that the Art Cinema isn’t screening are a few of the most recent Ghibli releases and the hefty post-war drama GRAVE OF THE FIREFLIES (1988), which is an extremely heavy film and is a bit more comfortable standing alone. Still, any established Ghibli fan or curious newcomer has plenty to choose from, and is highly unlikely to go home disappointed.